“The last few years have seen a bevy of high-profile retailers either go bankrupt or close stores across the country, raising concern that brick-and-mortar retailers are doomed. It’s undoubtedly true that consumers are buying more and more goods online, and that’s putting pressure on some retailers. 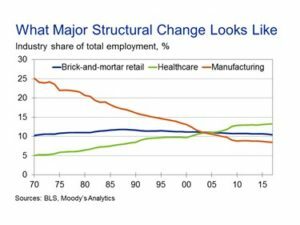 However, it’s important to put this in context: So far, the overall decline of brick-and-mortar retail is a relatively minor change in the economy, and not a major structural disruption. “This analysis suggests that when there is an empty mall or abandoned big box store, there is a good chance that it can be explained by lack of population growth or a weak economy. While the changes are not catastrophic, they are evident in the employment trend. The impact will continue to be seen in some large national brands, as a recent earnings report demonstrated. Shares of The Gap Inc. (NYSE: GPS) fell after the company disappointed investors when it released its earnings. There was some good news in the report as the company reported its sixth consecutive quarterly revenue beat. But, earnings failed to meet expectations, after four straight quarters of better than expected numbers. The Gap reported earnings per share of $0.42, three cents below the $0.45 expected according to the Zacks Consensus Estimate. Net sales grew 10% to $3,783 million, coming in above the Zacks Consensus Estimate of $3,608 million. Comparable store sales, an important indicator for retailers that measures sales at stress open at least one year, were up 1%. Same store sales growth was driven by 3% increases at Old Navy and Banana Republic. These gains offset a decline of 4% at the company’s Gap brand stores. Finally, management reaffirmed its guidance for the full year. Analysts were told to expect flat to slightly up same store sales and earnings between $2.55 and $2.70 a share. According to Zacks, the Consensus Estimate for the fiscal year is near the lower end of the range at $2.61. The missteps led to promotions during the quarter and a $28 million inventory charge. “As back-to-school aligns with the beginning of the back half, that is when we feel like we’re largely out of the operational issues,” said Art Peck, chief executive of Gap Inc.
SunTrust Robinson Humphrey analysts are not convinced. “While management seems confident in their ability to turn the Gap brand around in the second half, we have little to hang our hat on as of yet as the challenges at the division weighed on both comps and gross margin in the first quarter and inventory has not been fully right-sized,” analysts led by Pamela Quintiliano wrote. SunTrust rates Gap Inc. shares hold and lowered its price target to $29 from $35. With inventory problems weighing on the company, it could take time for the stock to recover. For GPS, we have a number of options available. 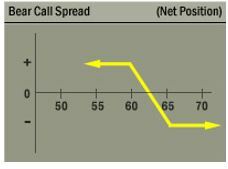 Short term options allow us to trade frequently and potentially increase our account size quickly. Short term trades also reduce risk to some degree since there is less time for a news event to surprise traders. In this case, we could sell a June 15 $29 call for about $0.45 and buy a June 15 $30 call for about $0.20. This trade generates a credit of $0.25, which is the difference in the amount of premium for the call that is sold and the call. Since each contract covers 100 shares, opening this position results in immediate income of $25. The credit received when the trade is opened, $25 in this case, is also the maximum potential profit on the trade. The maximum risk on the trade is about $75. The risk is found by subtracting the difference in the strike prices ($100 or $1.00 times 100 since each contract covers 100 shares) and then subtracting the premium received ($25). This trade offers a potential return of about 33% of the amount risked for a holding period that is about three weeks. This is a significant return on the amount of money at risk. This trade delivers the maximum gain if GPS is below $29 when the options expire, a likely event given the stock’s trend. Call spreads can be used to generate high returns on small amounts of capital several times a year, offering larger percentage gains for small investors willing to accept the risks of this strategy. Those risks, in dollar terms, are relatively small, about $75 for this trade in GPS.